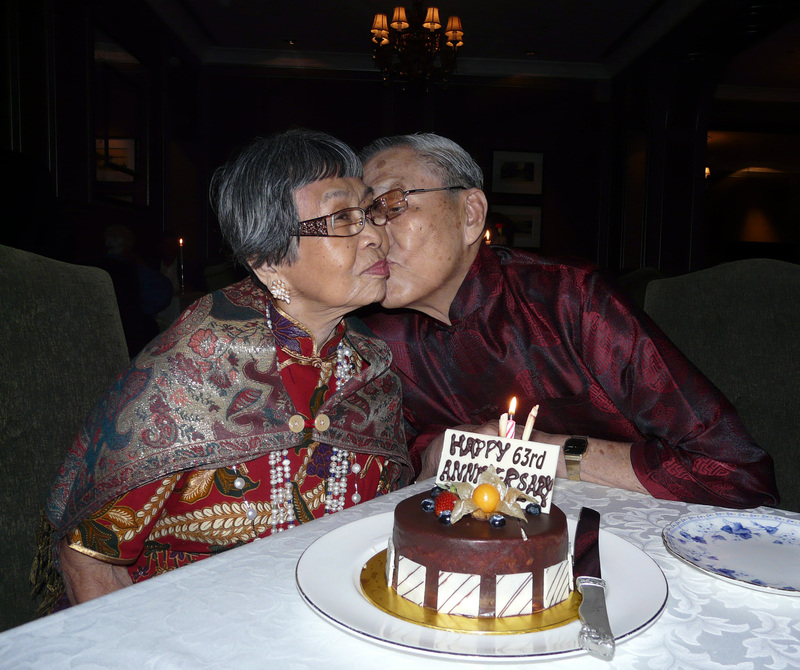 A cosy dinner at the E&O Hotel, to celebrate our 63rd Anniversary. Suzanne and I are new to blogging… and while we have so much to write about, we are not quite sure where to begin. Initially, we were planning to launch our blog on our 63rd Anniversary two months ago… so perhaps it is not too late to share a photo of our cosy dinner at the grand dame of Penang, the E&O Hotel. We have celebrated many an entertaining evening at the E&O Hotel, from as early as the 50’s, during the hotel’s hey day as a hub of social gatherings. Suzanne, always dressed in her elegant best, whether it was an evening dress of that fashion era or in her favourite cheongsam, was always the ‘belle of the ball’. We cut a handsome figure, (so says our daughter) on the dance floor, and, always in the company of good friends, we truly cherish those memories. Later on, we frequented E&O Hotel too, but more to enjoy weekend evenings at the then 1885 Lounge, where the talented Albert and Nancy Yeoh entertained the guests with their timeless renditions of songs from around the world. Albert with his magic fingers twinkling on the ivories, and Nancy with her unique singing style, and her famous chandelier earrings. Over the years, while the Hotel has taken on a new look, we still head to 1885 for special dinner occasions, savouring the good memories each time. Recently, Suzanne and I were interviewed by a lady from the E&O Hotel about our experiences there, and possibly we might be accorded a small mention in the annals of their glamorous history.